Multiplayer doesn't get more local than 12 orbits. If your are a YouTuber or Streamer, chances are that this is not the type of game you usually cover. But if you are into local multiplayer at all, or if you sometimes meet up with other creators, there is nothing else like 12 orbits. It is easy to learn even for non-gamers, but much deeper than you'd expect from a one-button game. 12 orbits can be played on pretty much anything, even keyboards that only support a few key presses at the same time. The only thing you need is other players, as it should not be played alone. 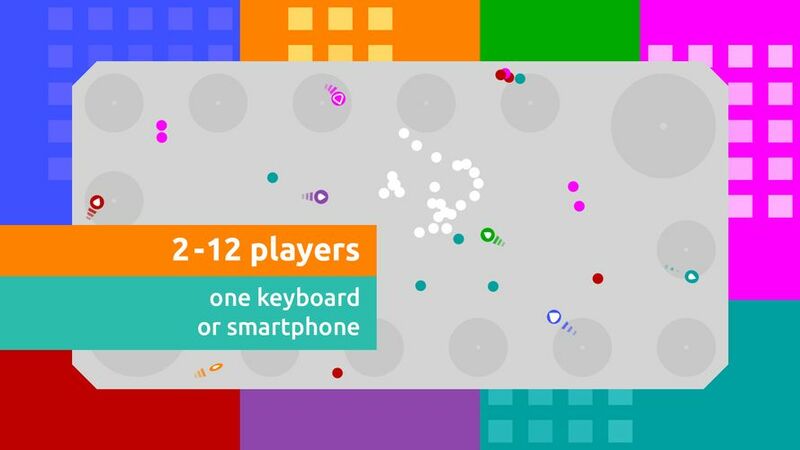 The game can be set up in seconds, even for 12 players at once. Rounds take about 5 minutes each. You can choose from 4 game modes, with each one focused on a different playstyle. For groups of 2 - 3 players, I suggest starting with the Arena game mode (after playing the tutorial). Anything above that, and the Blizzard game mode might be the best option for beginners. All game modes have simple rules, these two just make the first 5 minutes of learning the controls easier than others. Step 1 / 3 - Please enter your e-mail address to request one or more press copies of 12 orbits and press the next button to continue.